Cheryl was born and raised in Crofton, Maryland. Cheryl became an EMT-Basic in 2006, and served her hometown community for nearly five years. In 2010, Cheryl earned her certificate in Paramedicine from Anne Arundel Community College. Cheryl was then hired by Queen Anne’s County Department of Emergency Services. 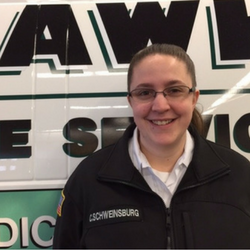 Cheryl moved to Troy, New York, in 2015, and joined Mohawk Ambulance Service in February of 2016. Since being hired by Mohawk, Cheryl has proven herself to be a vital asset to the team. Mohawk Ambulance Service is proud to honor Cheryl as an American Ambulance Association 2017 Star of Life. Cheryl has been recognized by her peers and supervisors as a “lead by example” role model who maintains a consistently positive attitude. In less than one year of employment, Cheryl earned Mohawk Ambulance’s Distinguished Service Award. Cheryl’s commitment to patient care is demonstrated by numerous compliments from patients and patients’ family members. Cheryl genuinely enjoys helping people in a career that presents new challenges every day.